The holiday season is a time when we stress out thinking about the desires of others more than ourselves. But as a mom I do that every day. So sometimes it's nice to just think about what I want. Since our money was so tight this year I told my family all I wanted was to be able to have money to do a few giveaways before the end of the year. Afterall, without the support of all of you wonderful visitors I'd be here talking to the crickets and questioning my sanity. I know you have a bazillion other places to stop on the hop so I'm making this one quick and easy... Rafflecopter to the rescue! P.S. -- I'm giving away a second $10 Amazon.com Giftcard on my other blog, RhiAlistic! Now hop on over to some of the other awesome blogs in the hop for more chances to win! I'm totally going to be naughty! I would definitely be naughty! All my Christmas shopping is done, which means BOOKS for me. :) Happy holidays! Hard to say...either my daughter will get a book she wants or I might be naughty and get myself a book. I'm done with Christmas shopping, so naughty! I'll be nice and get something for my dh. I've finished my Christmas shopping so I'll be naughty. Will have to be nice for me since I am way behind in my Christmas shopping. :D Thanks for entering everyone! Good luck to everyone in the giveaways! I am totally going to be naughty. I think I'm gonna be naughty, lol. Nice - another toys for my kiddos. I'm going to be naughty. I'm all done Christmas shopping. So I will treat myself. Nice. I will buy my Dad a book! I would use it to be naughty! I will be naughty and nice if I win. My gift to self would be able to be used by others. I want to say nice but will probably be naughty! It would certainly sound better if I said nice, but actually I'd probably use it towards buying some books. I'm not feeling very nice right now, so I'm gonna be NAUGHTY! NAUGHTY! NAUGHTY! I would be nice! thank you for the great giveaway! Totally be naughty... then nice. Naughty! For me! A book, of course!! Will you use this giftcard to be NAUGHTY (buy something for yourself) or NICE (buy something for someone else)? Nice because I have a few people I need stocking stuffers for. I actually would be nice and would buy a new book for my grandma since hers are falling apart ! I would be naughty and buy a couple of new books for my kindle. Nice :) I'd buy a toy for my grandson. Definitely Naughty. Mommy needs presents, too! And a happy mommy equals a happy family, right? I will buy a book for my long suffering husband ! I'm going to be nice and get a book for one of my siblings. But I'll probably be able to read what I get them. going to be nice- i still have so much shopping to do! Naughty! Although I never spend money on myself, so I don't consider this naughty!! I think I will be naughty since I have been nice all year. I am going to be naughty!!! Every once and awhile you need to do that! Now that I finished Christmas shopping I can be naughty and keep it for myself. I'll probably be naughty! Since I'm finished being nice! I would love to be naughty, but I have to be nice. I'll be naughty in January. I would be naughty and get something for myself. Great giveaway. I think I'll be naughty. Thanks for the chance. I will probably be "nice" as I am still finishing up Christmas presents. If I use it to buy a book both my mom and I want (Silence by Becca Fitzpatrick) and I share it with her, that still counts as nice, right? I'm buying something for myself, so naughty! I would be naughty and buy something for myself. I would be nice and use if for gifts for someone else because I have no money for gift giving this year. I will most likely be nice. I still need a couple gifts for Christmas. 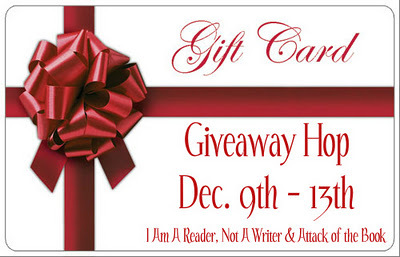 i also have a very limited budget and am also participating in this giveaway blog hop. I have to admit, I would be naughty and buy a book I have been wanting! Thanks for the chance! A little of both -- I'll get something the whole family can enjoy. Nice- use it towards family gifts! Definitely a gift for someone else! I'll be naughty, but only because I've already bought all my other presents for others. Naughty! I have all my presents bought already. I'd be nice and use this towards last minute gifts for my kiddos!! I'm going to be nice.... to get my dad the Bill O'Reilly Killing Lincoln book. I am most definitely going to be naughty. Have already finished Christmas shopping. Will be naughty. Thank you for the giveaway. Definitely naughty. I bought all my presents already and got a bit jealous of the nice presents I was buying for everyone else. I will be naughty. Happy Holidays! I would definitely be naughty. I've had my eye on a few books! I'd buy books for my classroom library...soo...that's like a combination of both, yes? I'm done with Chirstmas shopping, so I'd use this for myself. Naughty! I’m the only big reader in my family and among my friends. More books for me! I can't believe I'm going to say this but nice. I'm going to be naughty! I've been nice all year! I'll buy something for myself. I already finished shopping for everybody else. I am thinking Naughty, but might be nice and give to my best friend or husband! lol, It is the season to give. I'm going to be naughty since I am now finished with my Xmas shopping, gifts are wrapped so time for a book for me :). I will probably be naughty since I have all my shopping done!!! I would love to be naughty, but more than likely I'll be nice and buy some more things for my kids. I will probably be naughty and buy something for myself. Happy Holidays ヅ *Thanks* for the giveaway! I would buy something for me but share it with others in my household.